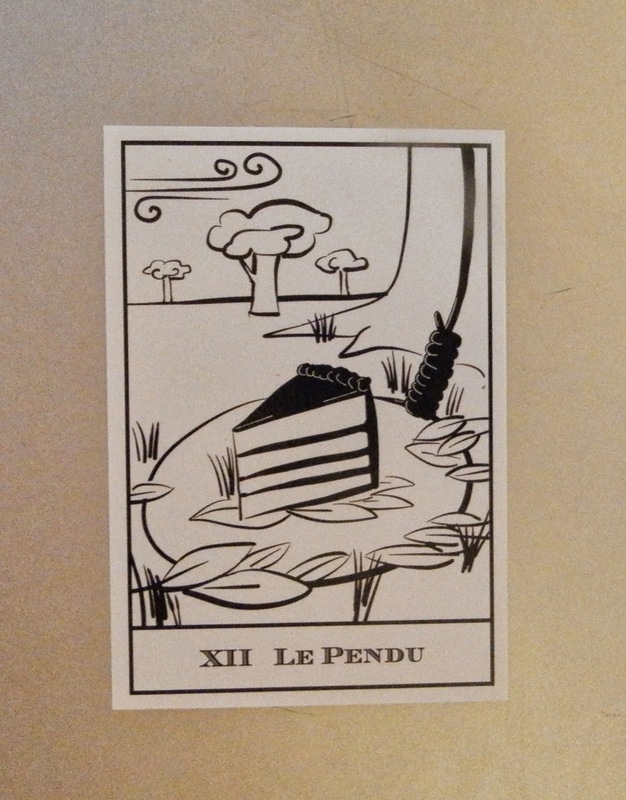 Today's Draw: Le Pendu or the Hanged Man from Tarot Waiting To Happen by Andrew Kyle McGregor. What tempts you? And when you satiate that temptation, how do you ultimately end up feeling? What is no longer working in your life? While I don't do reviews at The Daily Draw, I do comment on decks I find particularly gorgeous or clever. Tarot Waiting to Happen (TWTH) is a simply drawn, black and white, majors-only deck that falls into the latter category. What McGregor has done here is that he's imagined the energy of what happened just before the scene we're used to seeing in tarot. Drawing from the Tarot de Marseilles style, he wanted to to inspire us to expand the way we think of the major arcana. And he also wanted to make us smile. I think he's accomplished both. 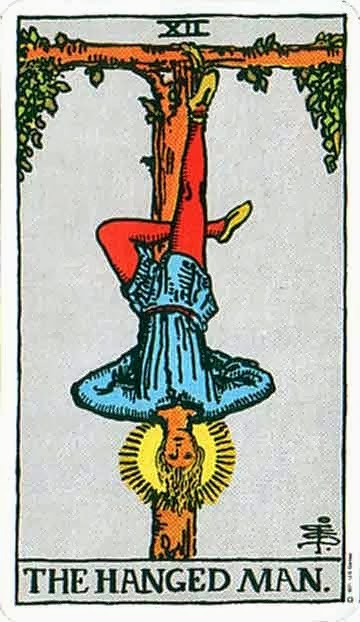 The Hanged Man card usually shows a man hanging upside down by one foot. The message of the card is of seeing things from a new perspective, making a sacrifice or voluntary sacrifice, surrender to what is or time spent in suspension. For those of you following the current government closure, that's how many workers feel today*...they have to wait in suspension and surrender to what is. 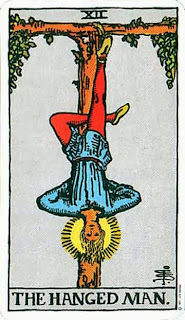 So the normal Hanged Man would certainly be appropriate for today. It's an interesting aspect of human nature that we often hold on to toxic behaviors until we become trapped—either by them or because of them. As I sit here writing this, my back and legs are sore. They're sore because I'm old, partly...haha. But they're also sore because I'm overweight and out of shape. And with a sore back and legs, it's hard to do much about the problem today. Ironically, the very things that I turn to for comfort (food and rest) are the same things causing my discomfort. 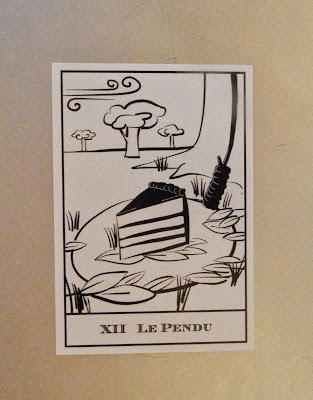 When Le Pendu grabs that slice of cake, he will learn the same thing while hanging upside down. One thing worth noting is that I've never seen the Hanged Man card drawn with cake crumbs and pieces laying beneath the man. Nor have I seen him drawn with icing on his face. So I imagine he learned his lesson about cake in the thoughtful moments during and after devouring every last crumb of it and licking his face and hands clean. Which is another interesting human thing. One of the local gurus here defines addiction as "pleasure followed by guilt." I love that. I extend it to all sorts of toxic behavior. We enjoy it, then beat ourselves up about it. So this brings up a lot of thoughts for me—thoughts about the pathways we follow in order to think past what's usual or comfortable for us and how that applies to my current issues. And that's what Le Pendu wants to happen. He wants us to go "there". Even if going there means to indulge the temptation enough times to see how it has the opposite of the desired effect....indulging it enough times to see it from another angle. Yesterday we talked about doing something different to inspire and support a change. Today we're talking about doing something the same way until it hurts enough to even see the different way. That doesn't have to be the case, but it's interesting how the things that have the biggest hold over us cause us to trap ourselves in that way first. Le Pendu is a reminder to us that doing what is comfortable and habitual will lead to discomfort and stagnation when the choices that used to work, no longer do. I love what my card art has inspired in your post here. It is so gratifying to find the ripples of the cards moving into the world in such eloquent words. It does not show my info for some reason but that is by me, Andrew.